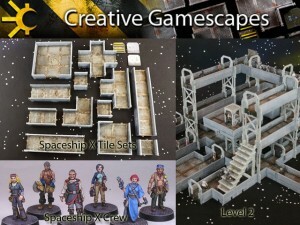 Creative Gamescapes has launched a Kickstarter campaign in order to fund their Spaceship X terrain line. Since the launch of Spaceship X, Creative Gamescapes, LLC, has wanted to add a line of Spaceship X Crewmen, produce a wider variety in the size and shapes of the basic rooms available and expand the vertical element to allow gamers to create a truly impressive gaming table with an added dimension. However, plastic injection molded products are really expensive to produce. The mold costs in particular are astronomical. Spaceship X Crewmen: We have had a number of different Spaceship X Crewmen models sculpted for us and have the master molds in hand. One significant goal of the Kickstarter is to fund the production molds and initial production runs of the Spaceship X Crewmen models. An initial set of four models produced in white metal (which may contain lead) will be offered as a basic pledge level. We have several more Spaceship X Crewmen that will be added as stretch goals. Spaceship X Level 2: Spaceship X Level 2, Creative Gamescapes newest gaming set, adds a vertical element to your games and allows multistoried gaming tables to be created. We have explored a number of different lasercut materials ranging from acrylic, PVC and birch plywood to expand the set.Each material has its own advantages and disadvantages. Acrylic, for example, makes great doors, but is very brittle when made into struts.Acrylic, PVC and ABS also use quite a bit of laser time and are therefore more costly.Wood is much faster to cut, saving money, but is not the same material as the base Spaceship X set. If this Kickstarter is really successful, it will allow us to produce Spaceship X Level 2 in injection molded plastic, which we really want to be able to do.